From the mind of the man who invented the song "Unskinny Bop" comes "No Code Of Conduct", his second directorial effort after A Letter From Death Row. 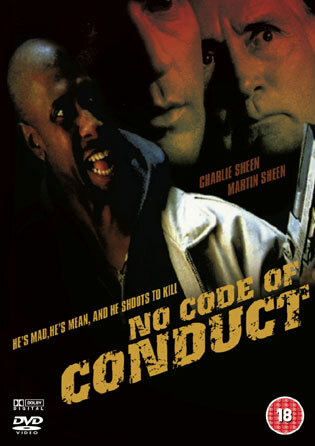 "Charles" Sheen as he liked to be called for 2 years (1997- to early 1999) was okay in this film. He plays a Cop On The Edge. He drinks too much and spends little time with his family etc. His father Martin is in it and plays a nothing role as his father. Joe Estevez of Money To Burn fame plays a helpful mechanic. The editing is very silly because there's always a "whoosh" sound before the scene starts. This was a lot better than 'Letter. So maybe Michaels is learning on the job as a director. We eagerly await his third feature and if current trends prevail, it should star Jonathan Bon Jovi or Franklin Muniz. 'Code is worth-seeing for "Charles", and also whatever happened for to Joe Lando? It seemed like in the 90s he was competing with Kevin Sorbo to be mainstream meatheads with similar names. I think we all know who won that battle...or do we?